The High Court of the Federal Capital Territory, Maitama, Abuja, on Tuesday, issued a production warrant and ordered that it be served on the Department of State Services to compel the Federal Government’s agency to produce the detained ex-National Security Adviser, Col. Sambo Dasuki (retd. ), in court. Justice Hussein Baba-Yusuf made the order following Dasuki’s absence from Tuesday’s proceedings in one of his two separate trials relating to corruption charges involving arms funds scandal. 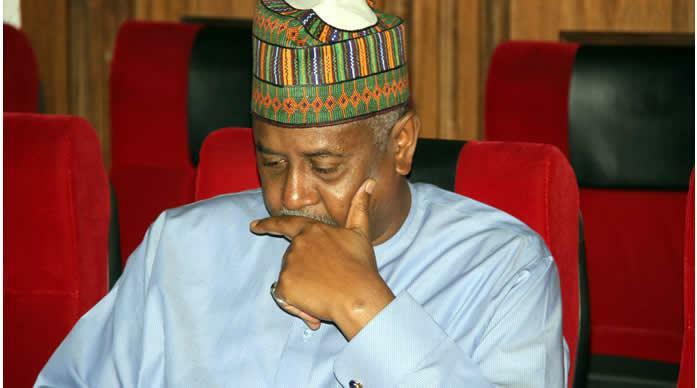 The Tuesday hearing was about the 32 counts in which Dasuki, and Aminu Baba-Kusa and Baba-Kusa’s two firms – Acacia Holdings Limited and Reliance Referral Hospital Limited – were accused of diverting N32bn meant for the purchase of arms. By virtue of the production warrant issued by the judge on Tuesday, Dasuki is expected to be brought to court on May 24. The second set of charges involving alleged diversion of about N13bn meant for arms purchase was filed before the same judge. Dasuki, a former Governor of Sokoto State, Attahiru Bafarawa, the ex-governor’s son, Sagir Bafarawa; and a former Minister of State for Finance, Bashir Yuguda, are the defendants in the case. Dasuki has been in the custody of the DSS since December 2015 for undisclosed reasons, in violation various court orders. His absence has stalled proceedings in the two pending trials for umpteen times. Defence lawyers – Victor Okwudiri (for Dasuki), Solomon Umoh (SAN), R.A. Rilwan and A.O. Ayodele –blamed the prosecution, for the ex-NSA’s absence from court on Tuesday. Mr Leke Atolagbe, a private lawyer prosecuting on behalf of EFCC, however, said the anti-corruption agency was blameless as far as Dasuki’s absence from court was concerned. He said, “All the defendants are saying that the 1st defendant (Dasuki) is in the custody of the state, but this honourable court has held that he is in the custody of the DSS and not the EFCC that is prosecuting this case. He reminded the court that the judge had issued a production warrant in the other case when Dasuki was absent from court. “I urge My Lord to issue a production warrant for the production of the 1st defendant as issued in the sister case,” Atolagbe added. He also urged the judge to hold that should the production warrant fail to get Dasuki to attend the next proceedings, the court should invoke the provisions of Section 352(4) of the Administration of Criminal Justice Act by ordering the trial to proceed in the defendant’s absence. He told the judge that such had already been done in a case in which the DSS was prosecuting Dasuki. But ruling, the judge noted that it appeared that Dasuki’s absence from the Tuesday’s proceedings was caused by the prosecution’s failure to liaise with the DSS to ensure that the defendant appeared in court on Tuesday. The judge then said, “The information before the court is that the 1st defendant is in the custody of the DSS and the prosecution is to liaise with the DSS to produce the 1st defendant in court any day the cases comes up. “But it appears that the prosecution has failed to do this and did not provide any explanation for failing to do so.